Theory of applied behavior, entrepreneurial intentions, senior executives, work experience, entrepreneurship. An entrepreneur is 'a person who undertakes a wealthcreating and value adding process, through incubating ideas, assembling resources and making things happen' (Kao, 1993). The characteristic of opportunity identification enables the entrepreneur to start and succeed in starting own business, notwithstanding adverse economic conditions. Therefore, the entrepreneur and his/her behavior become central to the process of venture creation. As the entrepreneur is a complex combination of interacting factors, understanding the behavior of entrepreneurs becomes significant before understanding the dynamics of the process of venture creation. There is a large amount of focused research on entrepreneurship but most of it is focused on western populations. Studies in this field use a number of theories like career-choice theory, causation/effectuation theory, etc are used to understand the process of venture creation. Theory of Planned Behavior (TPB) is the basis of this study. TPB has been extensively used in research to study entrepreneurial intentions. According to this theory, developed by Ajzen, behavior intentions are a function of three determinants: an individual's attitude toward behavior (EA), subjective norms (SN), and perceived behavioral control (PBC) (Ajzen, 1991) (see Fig 1). Studies by Carr and Sequeira (2007), Kautonen et al. (2009, 2010), Schwarz et al. (2009) (to name a few) have revealed many more determinants of entrepreneurial intentions. The present study aims to study the impact of 3 factors of TPB on entrepreneurial intentions of Indian populations. The respondents of this study are final semester students of business administration of a private university. All of them are pursuing Master of Business Administration program through distance learning mode. As this is an accelerated program for senior executives, all the respondents have prior work experience of not less than 4 years. Review of research reveals that entrepreneurship is viewed as a type of planned behavior and use of intention models is appropriate for investigating entrepreneurial intentions (Autio et al, 2001). The results have been found to vary depending on geographical regions and population characteristics. Studies by Tkachev & Kolvereid (1999) on University students in Russia, Linan & Chen (2009) on University students of Taiwan and Spain, Peng et al (2012) on University students of China, Shaik Karim, Lokanadha Reddy (2014) on Students of Chittoor District, Andhra Pradesh reveal that all the three constructs of TPB, EI-EA, EI-SN and EI-PBC are found to be significant. However, some studies have indicated nonsignificance of EI-SN construct (Kreuger et al, 2000; Moriano et al, 2014). For the present study, work done by Linan & Chen (2009) is used as basis to understand the models on intentions. Based on the findings of the literature review, the following important factors are proposed to be studied. The third antecedent of intention is the degree of perceived behavioral control. This refers to the perceived ease of performing the behavior and to the perceived control over the outcome of it. Some studies have given precedence to PBC and shown that EA and SN play a supporting role to PBC in forming intentions (Autio et al, 2001). This construct will be analyzed using the three components of personal control (PC), fear of failure (FOF) and confidence of one's skills (CON) regarding setting up own business. It is linked to control beliefs, which refers to beliefs about the presence of factors that may facilitate or impede performance of the behavior (Rhodes et al, 2006, Sparks et al, 1997). The model proposed in this study gives equal importance to all the three aspects EA, SN and PBC. A conceptual model which reflects the influence of the three factors on entrepreneurial intentions is shown in fig 2. The research model has 3 constructs with 19 independent variables. Bivariate correlation carried out on the data revealed linear relationship between variables that falls into a pattern as indicated in the research design. However, some variables also showed significant relationship with few other variables. As the number of variables is large, Exploratory Factor Analysis (EFA) is conducted. The correlated, observed variables are found to associate with 4 latent variables or factors. This largely confirms the association as indicated by the bivariate correlation. 4 factors with Eigen value more than 1 are considered. This is supported by results of Scree plot. 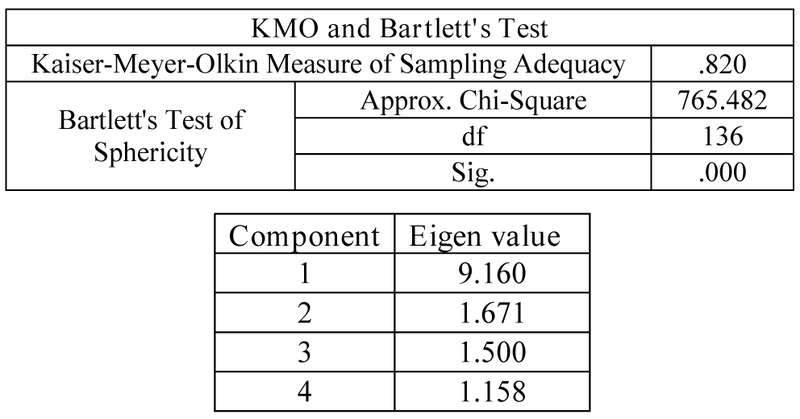 In the sample, the Kaiser–Meyer–Olkin test for sample adequacy (KMO) was notably high (.820) and Bartlett's sphericity test was highly significant (p < .001). Both statistics suggest that data is suitable for factor analysis. EFA results are submitted in Table-2. All the items loaded highly on their respective factors/constructs and variances were above 70 percent indicating high convergent validity. From the EFA results shown in Table 2 it is evident that the constructs have high reliability. 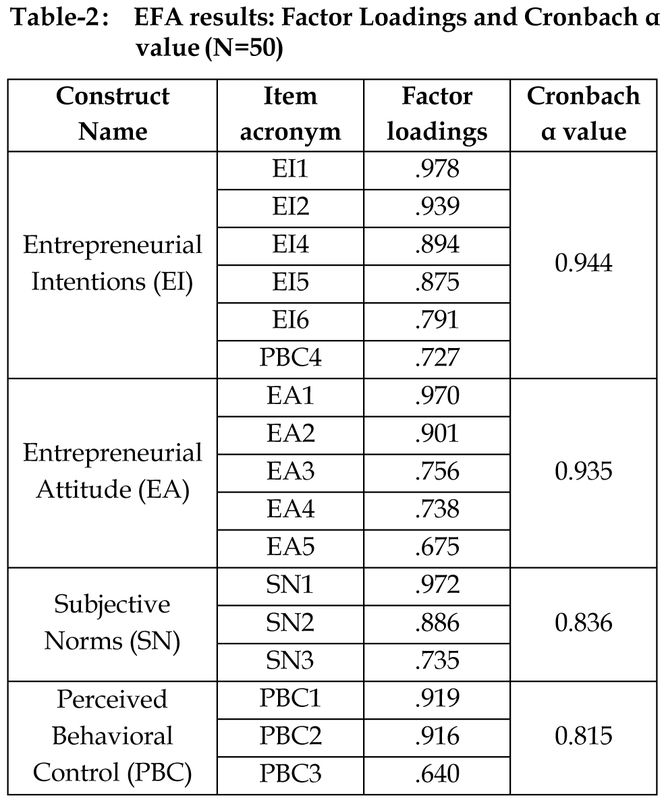 All the constructs display Cronbach á values that are >0.7. So it can be inferred that the constructs have good reliability. 5 items pertaining to attitude (EA), 3 related to subjective norms (SN), 3 items of perceived behavior control (PBC) are identified after performing EFA. 6 items pertaining to intentions (EI) are also identified, taking the total number of items to 17. One item from PBC construct was found to cross-load into EI. This is in line with the view that perceived behavioral control items are strong predictors of intentions (Kraft et al, 2005). Two items of PBC did not load cleanly and were rejected. While EFA revealed the number of constructs involved in the study, the relationship between latent constructs and overall model fit is determined by confirmatory factory analysis (CFA). This is used to verify factor structure of a set of observed variables and their underlying latent contructs. The present study applied Structural Equation Modeling (SEM) using AMOS 21.0 software. Fit for all models was evaluated using the following fit indexes Root mean square error of approximation (RMSEA) with a value 0.06 indicates a good model fit, and 0.08 indicates an acceptable model fit. The Tucker-Lewis index (TLI) and the comparative fit index (CFI) is also reported : for both values, .0.90 indicates sufficient model fit (Vandenberg and Lance, 2000; Kline, 2011). CFI=0.914 and IFI=0.917 are values >0.9 indicating a moderate fit of the model. TLI (also called NNFI) =0.893. As it is customary to report only CFI or TLI, CFI values are reported for this study as the values are >0.9. RMSEA values depend on sample size and degrees of freedom (df). If RMSEA values are between 0 and 0.8, it indicates an excellent fit of the model (see Fig 3). The obtained value of 0.111 indicates a mediocre or moderate fit of the model with the data. Overall, the model can be considered to be a moderate fit. It is evident from the structural model that of the three parameters, EA, SN and PBC, exert a positive impac t on ent r epr eneur ial intentions moderate as evident from the figure. EI ? EA is found to be of highest valued followed by EI ? PBC. The relationship between EI and SN was found to be least. Also, covariance was found between some items of all the three constructs. The attitude item 'To me, being an entrepreneur means more advantages than disadvantages' Is linked to the attitude item ' Beingan entrepreneur would give me great satisfaction' The entrepreneurial intention item 'I am ready to do anything to be an entrepreneur' is linked to the intention item 'I am determined to start a firm in future'. This paper systematically explores the influence of three psychological/internal aspects of individuals on their entrepreneurial intentions. The results show that all the three factors exert significant influence on intentions thus play a major role in shaping the entrepreneurial intentions of individuals. The significance of subjective norms having the weakest impact on intentions needs to be examined in the context of the age and experience of the respondents. The strong impact of attitude on intentions places the individual at the centre of the entrepreneurial ecosystem. Various programs/schemes designed to promote small and medium-scale businesses have to suit the individual needs. Kao R W (1993) Defining entrepreneurship: Past, present and ?, Creativity and Innovation Management, 2(1), 69-70. Butler, D. (2006). Enterprise Planning and Development. Routledge. Boulton, C. and Turner, P. (2005), Mastering Business in Asia: Entrepreneurship, Singapore: John Wiley and Sons. Carr, J. C., & Sequeira, J. M. (2007). Prior family business exposure as intergenerational influence and entrepreneurial intent: A theory of planned behavior approach. Journal of Business Research, 60(10), 1090-1098. Kautonen, T., Van Gelderen, M., & Tornikoski, E. T. (2013). Predicting entrepreneurial behaviour: a test of the theory of planned behaviour. Applied Economics, 45(6), 697-707. Schwarz, E. J., Wdowiak, M. A., Almer-Jarz, D. A., & Breitenecker, R. J. (2009). The effects of attitudes and perceived environment conditions on students' entrepreneurial intent: An Austrian perspective. Education+ Training, 51(4), 272-291. Ajzen, I. (1991). The Theory of Planned Behavior. ORGANIZATIONAL BEHAVIOR AND HUMAN DECISION PROCESSES 50, (1991), 179-211. E Autio, R H. Keeley, M Klofsten,George G. C. Parker & Michael Hay,2001, Entrepreneurial Intent among Students in Scandinavia and in the USA; Enterprise and Innovation management studies; volume 2, 2001 - Issue 2;Pages 145- 160. Alexei tkachev and lars kolvereid, Self-employment intentions among Russian students, entrepreneurship & Regional Development vol. 11 , iss. 3,199. Krueger, Reilly & Carsrud, 2000, Competing models of entrepreneurial intentions, Journal of business venturing, Volume 15, Issues 5–6, September–November 2000, Pages 411–432. Liñán, F. (2004). Intention-based models of entrepreneurship education. Piccolla Impresa/Small Business, 3(1), 11-35. Virick, A. B. (2008). Assessing Entrepreneurial Intentions Amongst Students:A Comparative Study. National Collegiate Inventors and Innovators Alliance. Proceedings of the ... Annual Conference. (2008). Van Gelderen, M., Brand, M., van Praag, M., Bodewes, W., Poutsma, E., & Van Gils, A. (2008). Explaining entrepreneurial intentions by means of the theory of planned behaviour. Career Development International, 13(6), 538-559. Linen, Chen; 2009;Development and Cross-Cultural application of a specific instrument to measure EIs; Baylor University. E Autio, R H. Keeley, M Klofsten,George G. C. Parker & Michael Hay,2001, Entrepreneurial Intent among Students in Scandinavia and in the USA; Enterprise and Innovation management studies; volume 2, 2001 - Issue 2;Pages 145-160. Moriano, J. A., Gorgievski, M., Laguna, M., Stephan, U., & Zarafshani, K. (2012). A cross-cultural approach to understanding entrepreneurial intention. Journal of career development, 39(2),….162-185. Zhengxia Peng, Genshu Lu, Hui Kang, Entrepreneurial Intentions and Its Influencing Factors: A Survey of the University Students in Xi'an China, Creative Education, 2012. Vol.3, Supplement, 95-100. Saini, P. K., & Gure, G. S. AN EMPIRICAL STUDY ON THE INFLUENCES OF GENDER, ACADEMIC STREAMS AND FAMILY OCCUPATIONAL BACKGROUND ON THE ENTREPRENEURIAL ATTITUDE OF UNIVERSITY STUDENTS, International Journal of Multidisciplinary Thought, CD-ROM. ISSN: 2156-6992 :: 05(04):291–305 (2015). Kolvereid, Lars. "Prediction of employment status choice intentions." Entrepreneurship: Theory and Practice, Fall 1996, p. 47+. Kraft, P., Rise, J., Sutton, S., & Røysamb, E. (2005). Perceived difficulty in the theory of planned behaviour: Perceived behavioural control or affective attitude? The British Journal of Social Psychology, 44, 479-96. Hair, J., Black, W., Babin, B., Anderson, R. and Tatham, R. (2006) Multivariate Data Analysis, 6th ed., Pearson Prentice Hall, Upper Saddle River, NJ. Davidsson, Per (1995) Determinants of Entrepreneurial Intentions. In RENT XI Workshop, Nov 23 to 24 1995, Piacenza, Italy. Jennie Elfving, Malin Brännback, and Alan Carsrud, 2009, Toward A Contextual Model of Entrepreneurial Intentions ch 2 Understanding the Entrepreneurial Mind, International Studies in Entrepreneurship. Krueger Jr NF & Brazeal D V (1994), Entrepreneurial potential and potential entrepreneurs, Entreprenship theory and practice, 18(3), 91-104. Trafimow, D., Sheeran, P., Conner, M., & Finlay, K. A. (2002). Evidence that perceived behavioural control is a multidimensional construct: Perceived control and perceived difficulty. The British Journal of Social Psychology, 41, 101- 21. Bagozzi, R. P. (1978). The construct validity of the affective, behavioral, and cognitive components of attitude by analysis of covariance structures. Multivariate Behavioral Research, 13(1), 9-31. Robert A. Baron, 2008, The Role of Affect in the Entrepreneurial Process, The Academy of Management. Cotte, J., & Wood, S. L. (2004). Families and innovative consumer behavior: A triadic analysis of sibling and parental influence. Journal of consumer research, 31(1), 78-86. Marija Ham, Marina Jeger & Anita Frajman Ivkovic, 2015, The role of subjective norms in forming the intention to purchase green food; Economic Research-Ekonomska Istraživanja Vol. 28 , Iss. 1, 2015. Rhodes, R. E., Blanchard, C. M., & Deborah, H. M. (2006). 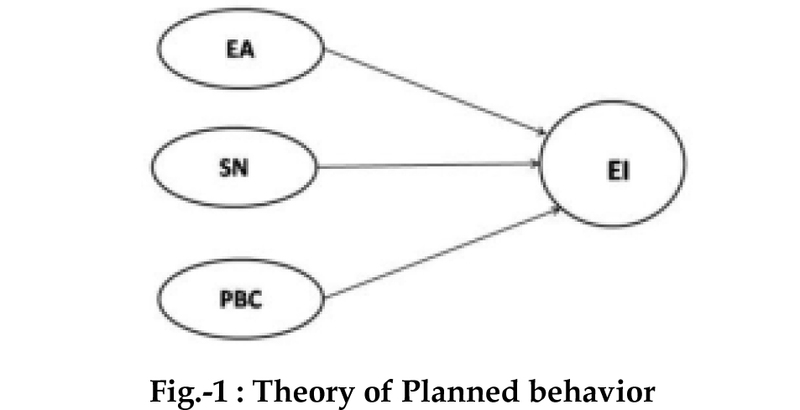 A multicomponent model of the theory of planned behaviour. British Journal of Health Psychology, 11, 119-37. Sparks, P., Guthrie, C.A., & Shepherd, R. (1997). The dimensional structure of the perceived behavioral control construct. Journal of applied social psychology, 27(5), 418- 438. Kline. 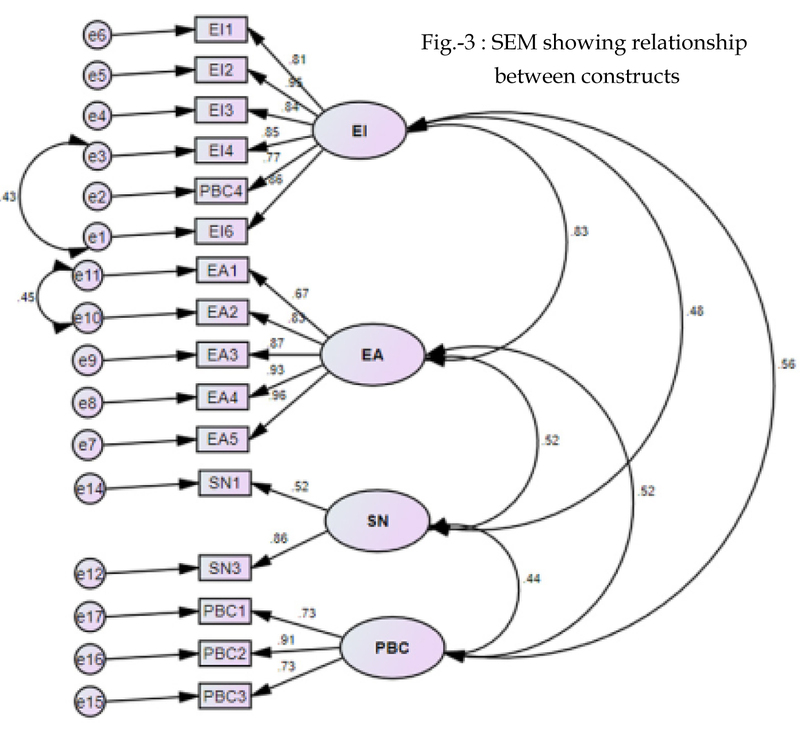 R.B, 2011, Convergence of structural equation modelling and multilevel modeling.na.